Many living things need each other to survive. 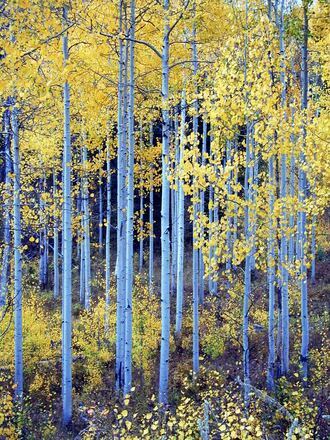 I have lived for most of my life near trees known as Colorado aspens. If you are familiar with this tree, you may have noticed that it does not grow alone. Aspens are found in clusters, or groves. We’re told that the reason for this is because aspens can multiply from the roots. They send up lots of new shoots every year. These become saplings that grow quickly and make new baby aspens of their own. In some groves, all of the trees may actually be connected by their roots. It is as if they are one tree. Another tree, the giant California redwood, may tower 300 feet into the sky. We’ve seen pictures of tunnels carved into massive trunks wide enough to drive an automobile through. It seems they would require the deepest of roots to anchor them against strong winds. But instead their roots are actually shallow -- they spread out wide in search of surface water. And they reach in all directions, intertwining with roots of other redwoods. Locked together in this way, all the trees support each other in wind and storms. Aspens and redwoods never stand alone. They need one another to survive. People, too, are connected by a system of roots. We grow up in families that nurture and guide us. We learn early to make friends who support us in different ways. We are not meant to survive long without others. And like the giant redwoods, we do best when we hold onto one another and help each other to keep standing through life’s storms. We need others to hold us up, encourage us and to stand with us. When I’m not doing well, it is often because I am going it alone. I don’t always let others in. I forget to ask for help; I keep my problems to myself. And though I may not see it, others around me might be doing the same thing. It helps to remember how much like those trees we really are. It might be time to let someone else help hold you up for awhile. Or perhaps someone needs to hang on to you. wow, this is amazing and so true of what our family is dealing with and going through. such a great reminder that we do have people in our lives to help and support us. have a nice day ,Iam very happy to know one persone like you . every one need each other but in diffrent ways and every one can help any one in his / her life . yes, Iam accountants manager without job . so , my dream different now my dream now how can I find job so, the life get you thinking in your life and your dream . Best of luck , and be HAPPY .. those who wish to sing, always find a song !